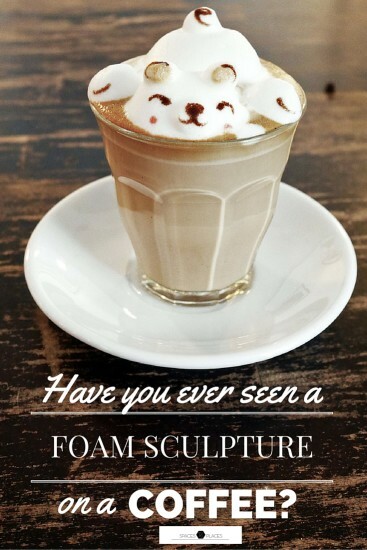 Have you ever seen a foam sculpture on a coffee? Well, I have. While I was travelling in Kuala Lumpur, Malaysia, I ventured down to Jalan Sultan, a central street in Chinatown, after seeing some impressive 3D Latte Art pics on Instagram. That’s how I found Coffee Amo. Such a lovely place! The entrance is quite small, not really attractive; since the coffee shop is actually on the first floor the entrance itself looks quite dark with just a staircase that leads upstairs so I guess you need to know about this place or it can be really hard to stumble upon it. The interior is just so cozy and relaxed, nicely decorated with accents of red and pop blue in a black and white wall canvas with really cute chalkboard drawings. Since I stepped in I loved the chilled out atmosphere this place has. The staff is really friendly and watching the barista making the foamy milk sculpture coming alive it’s just a pleasure! The result is so lovely! Too cute to drink it! After few minutes of photo shooting (as usual for me) I couldn’t help myself from staring at it before destroying that cute little face. And a plus: the coffee is actually really good. Certainly a must-go coffee shop if you are in Kuala Lumpur! Have you ever tried something like this? It was the first time for me so I was pretty excited! Hope to find other places maybe here in London that make 3D latte art. Tell me you know some!! I will!! I’m working on new content just right now 😉 Thanks for your support!